This node creates masks from an RGBA file. The operation is the same as for importing terrains from an RGBA file and the same file formats are supported. 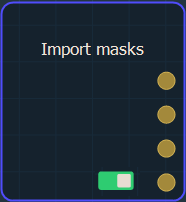 This node has four output masks instead of a single one in the Import mask node. The first mask is extracted from the red channel of the texture. The second one is from the green channel. The third one is extracted from the blue channel. The fourth one is extracted from the alpha channel. To add a node, right click in the Graph Editor and select Create Node > Import > Import mask from RGBA file.